As I have mentioned in a previous blog post, I am heading to the Rheinland-Pfalz area of Germany with Family Tree Tours this fall. As a tour company specializing in genealogy, their trips combine the best of both worlds - travel to beautiful locations and the opportunity to learn more about your family heritage. In looking at all the names in my family tree, including those of Jim's ancestors, I was only able to locate one family in this part of Germany. 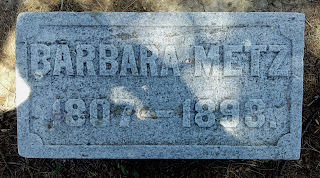 But it happens to be the Metz family, and I have a couple of cousins who have previously researched the family so at least I have a base to work with. 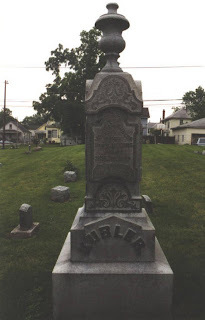 My 2nd great-grandfather was only 43 when he died of a bee sting in Insheim in 1862. 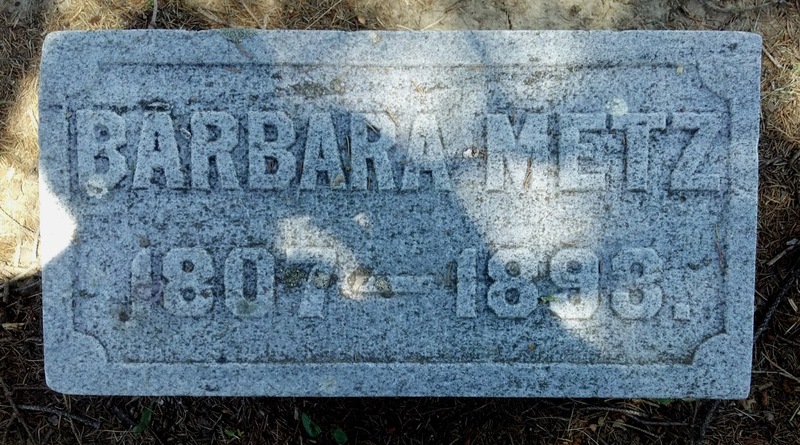 His wife Barbara was left with a rather large family to raise, including my great-grandfather who was only 4 months old when his father died. In 1866 Barbara boarded the ship Fulton with 6 of her children, heading for Cincinnati where at least one of her older children resided. I provided Family Tree Tours with all the information I had about this family. I was excited to learn recently that the company has already heard back from volunteers willing to help research my Metz family in Insheim, Germany. Someone will meet me when I arrive in the town and will show me around the area and talk to me about what they have found. Insheim is only about 30 minutes away from the town of Speyer that will function as our base on the second half of our trip, so that will be an easy trip to make. As I studied the map of the part of Germany where we will be staying and traveling, I decided to gauge the distance between Speyer and Busserach, Switzerland. It appeared to be about a 2-3 hours ride. Busserach is where my 2nd great-grandfather Joseph V. Kubler was born. Kubler is my maiden name, which we always believed to be German. As I began to research the name many years ago, I traveled to Connersville, Indiana where Joseph raised his family and is buried. I found a death notice in the newspaper that stated he came from Busserach. An additional article in a book about leading industries in Fayette County, Indiana corroborated that fact. My dad was so surprised to learn that he was Swiss! No one had ever mentioned it in the family. I forwarded my information to Family Tree Tours, and they said it would be doable to travel to Busserach though I will have to spend the night there due to the distance. They contacted someone in the town and heard back from them right away. Someone from Busserach is willing to show me around the area, and there are still families named Kubler who live there. Further, they forwarded a Kubler family tree dating back to 1700! Is it my tree? I don't know yet as the birth year for their Josef and the one I have for Joseph (father of Joseph V.) is off by quite a bit. But it definitely points me in the direction of what I need to do next in order to see if they are one and the same. In all my years of doing genealogy, and house research as well, things have never come easy. To have the opportunity to see these two ancestral towns with experts from the area is something I never dreamed would happen. I believe I will have much to write about this fall! It is hard to believe that my dad has been dead for over nine years now. Not a day goes by that I don't think of him. Here is the poem that I wrote and put on display at his funeral in 2004. Be joined by all of those you’ve loved. You are in a better place, I know. At times it must have seemed a living hell. Brought you back, sound of body and mind. Until once again it was just you two. The trips, the poor, a chorale group to run. And through it all you seemed so strong. The footprints you’ve left won’t be erased. Not question the reason or the why? No better father could I have had than you! Happy Father's Day, dad! Love and miss you! Each year since the St. Louis Cardinals opened their new stadium they have had a Founders Day at the ballpark. Jim and I have been lucky enough to go to three of the events. Since we share our group of four season tickets it is not always easy to score admission to this. Hot dogs, brats, nachos, pretzels, popcorn, ice cream and soda are all free. You can take a tour of the team locker room and dugouts, have your picture taken with the World Series trophy, get autographs from retired players, and other fun things. This year in honor of the 20th anniversary of the movie The Sandlot (and how can that possibly be? ), the director of the movie and one of the stars were at the stadium. They answered questions from the fans and later signed movies and posters that were available for sale that night. But best of all they played the movie on the giant screen in the stadium! You could sit in the seats or take a spot on the grass in the outfield. What a great evening! We have many fond memories of watching that movie with our son, who was playing ball himself at the time. How wonderful that a whole new group of children is being introduced to this family film. The weather was perfect, the company was exceptional, and we all cheered at the happy ending. Play ball! Last week was a busy one as we were preparing for the party we held Friday night. Jim and his business partner decided to have a dinner party at our house for all their staff, including families. I tried to talk Jim into hiring a caterer, but he wanted to grill. And we all know the rest of the meal doesn't just appear by itself. We spent some time coming up with a menu, and then I spent a lot more time cleaning the house and then washing down all the outdoor furniture. The weather forecast was good, so I was hoping we could entertain everyone outside. Jim took Friday off to help, so we first made the grocery store run where it took us two carts to get everything out to the car. Back at home I made the two desserts I was preparing while Jim began icing down the drinks. The day passed quickly but we were actually ready an hour before the arrival of the first guests at 4:30. Unheard of for us! I think we had about 35 people here, and it seemed as if everyone had a good time. The weather was perfect and we were able to enjoy the backyard at its finest. Saturday Jim took a long motorcycle ride to unwind, and I finished tidying up from the party before plopping down with a good book. Yesterday we spent a couple of hours at the Missouri Botanical Garden, and made it home before the downpour occurred. Add to all of this that I had great conversations with both of the kids, and it was indeed a perfect summer weekend! 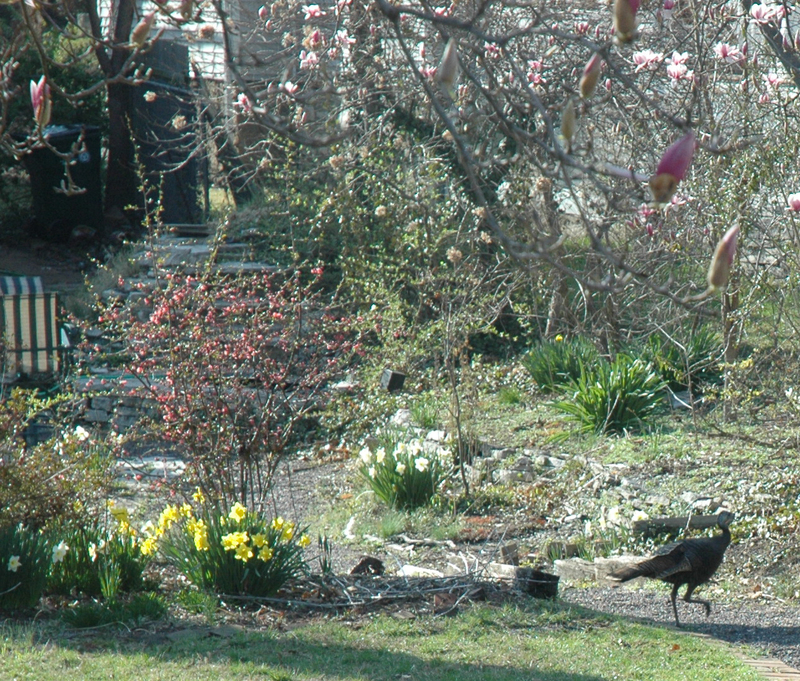 A couple weeks ago I glanced out the kitchen window to see a big bird sitting on the grass. 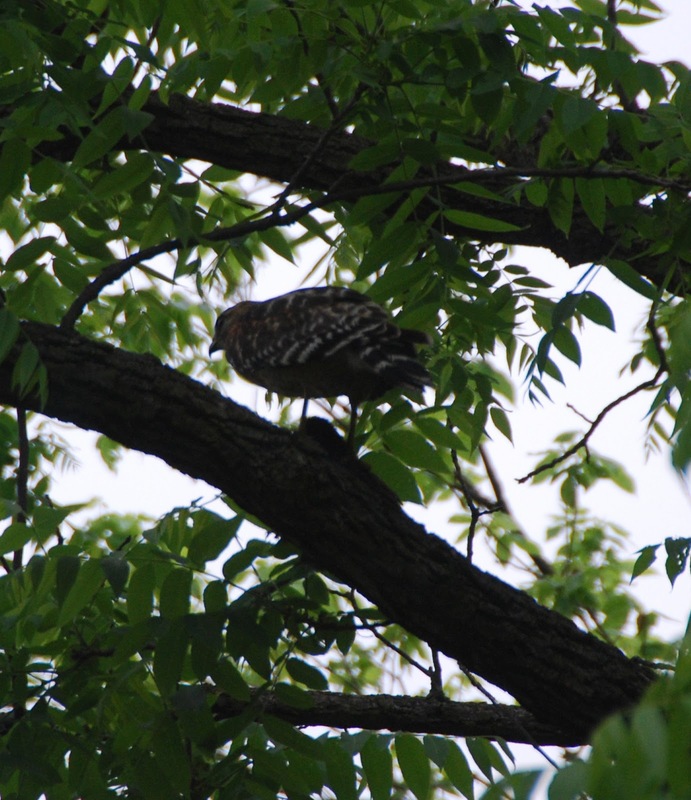 Before I could grab my camera, it flew up into the tree with a bunny in its grasp. I wasn't sure what kind of bird it was, but using my telephoto lens I took a picture of it up in one of our trees. My husband identified the bird as a hawk. I have never seen one that close before. Two days later we let the dog, fresh from the groomer, out in the yard and he proceeded to rub his whole neck area in something terribly disgusting. My husband tried to wash him with a cloth, picking chunks of something out of his fur along the way. I threw Kirby in the sink for another bath, nearly gagging on the smell. I am guessing that he found the remains of the bunny somewhere in our yard. Fortunately it was a milder day and I was able to open all the windows and air out the house. I haven't seen the hawk or any bunny parts since that day. But it reminded me of the time I went around the corner of our house with Kirby on a leash to go on our daily walk. I was startled by some rustling noise caused by a huge bird. Again, I had no idea what kind of bird it was, but I threw the dog in the house and grabbed my camera. The bird had a gangly walk, and made no attempt to fly. As I was chasing it through yards, my neighbors started coming out of their houses to see what I was doing. 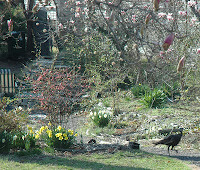 Soon it was like the Pied Piper, me following the bird and the neighbors following me. It was pretty comical! This went on for a couple of blocks before the bird tired of the game and flew over a fence to escape the entourage. Several people confirmed that it was a turkey! Since I have only seen the ones in the freezer compartment of the store, it was news to me. But it made for a great story, and the added benefit of making the acquaintance of some new neighbors. We were at the Fox Theatre tonight when the tornado warning sirens were going off in St. Louis County. I had never really considered the best place to be in the Fox should a tornado hit. We were not advised to take shelter since the storm was off to the west, and the show did indeed go on! And what a show it was. 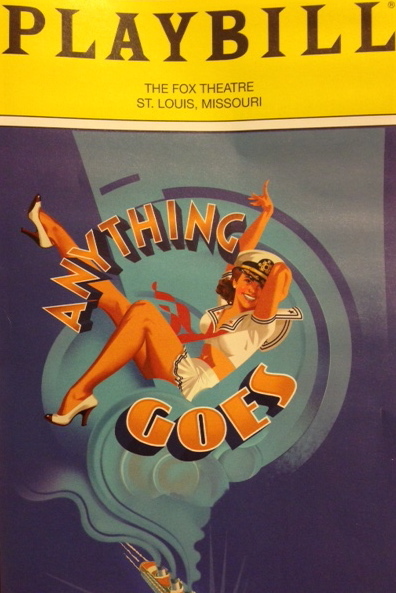 I have never seen Anything Goes before, but what a high energy production. The music, dancing, singing and set design were great. We thoroughly enjoyed the show, and it was nice to forget about the storm for awhile. Reality set in as we made a mad dash for the car, parked several blocks away. Interstate 44 was thankfully not very crowded, because the pouring rain made it very difficult to see the lines. It was probably the worst weather conditions I have driven in for a long time. Creeping along at 40 miles per hour made the drive home a lot longer than usual, but we made it safe and sound. So far other than some water in the basement, I don't think we had any damage here at the house. Tomorrow will tell. To all of those in St. Louis and Oklahoma who did not fare so well, my thoughts and prayers go out to you.